A stunning oceanfront location in Samsara Estate at Kamala, Hale Malia a holiday home of unmatched character and comfort. 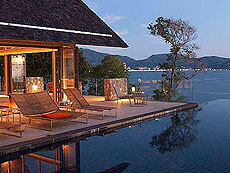 Panoramic wrap around outdoor decks frame a 14m infinity edge pool which fades into the Andaman Sea beyond. Also have a built-in BBQ, a large comfortable open air sala complete for relaxed and meditation. Uniformed English speaking staff reside in the villa year-round who take care of you during your stay at villa.